Part of the Private Natural Heritage Reserve, Rio Sucuri is located in São Geraldo Farm, around 18 kilometres from Bonito. 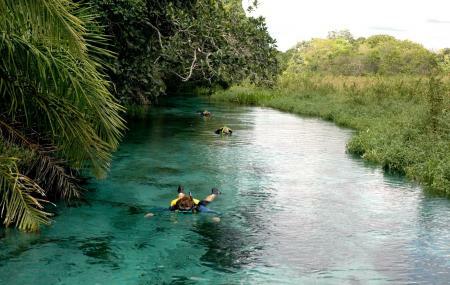 Spread across an area of 8,405 hectares, this is the best spot to snorkel and explore the magnificent underwater life. Providing guided tours of the farm as well, the grounds also include a shop, bar, restaurant and locker rooms. Booking a slot in advance is mandatory and the entire process begins with an introduction and training session followed by a pleasant hike through the native forest towards the river where you will get to snorkel and see native fishes like Dourados, Piaus and Piraputanga among others. Apart from snorkelling, one can also opt for bike tours, ATV tours, Horseback riding and much more. All activities have individual fees. Children under 5 years old are allowed to go with their parents or a responsible adult. It is not allowed snorkel with sun block, tanning lotion or any kind of moisturizing. The mentioned ticket price is for snorkelling. Other activities will be charged extra. It is recommended to visit between 9:00 am to 12:00 pm. How popular is Rio Sucuri? People normally also visit Gruta De Sao Miguel while planning their trip to Rio Sucuri. Nascente sempre deve ser preservada!